We live in a techy-world! From computers and smart phones to earbuds and speakers, we use digital items on a daily basis. Sometimes the best gadgets are ones that help me better utilize the digital devices I already own. Summer brings with it a set of circumstances that require us to take better care of our devices: heat, dust and sweat. As a runner, I work my iPhone hard. Although I try to avoid really hot runs, it's inevitable. Between the sweat and grime from holding my phone to abusing my ear phones, it's a wonder any of my tech devices survive! 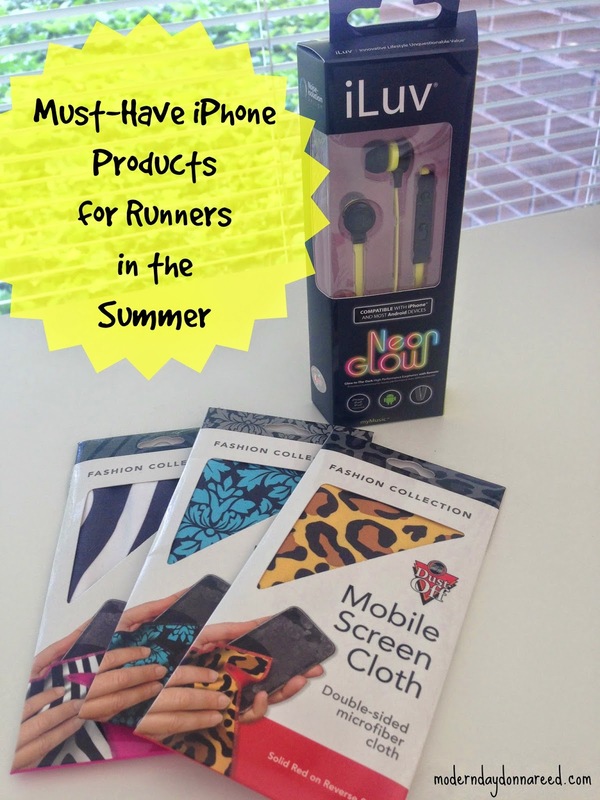 I had the chance to check out two great products that are must-haves for runners during the Summer! One of the tips I gave on my Running in the Summer post was to avoid running during peak heat hours. I try to run in the early morning or late evening on hot summer days. The sun is low on the horizon, which staves off the heat and humidity. It also means it is darker. The Neon Glow earphones from iLuv are colorful and glow-in-the-dark. The earphones offer a durable design as well as outstanding sound quality, ideal for running! Let's face it: running with my iPhone (even with a great DualTek case on for protection) makes my screen a filthy mess. The Fashion Collection Mobile Screen Cloths from Dust-Off are double-sided microfiber cloths are made of a durable microfiber material that cleans sensitive surfaces of dirt, grime, fingerprints, facial oils and makeup. Yes, that includes the sweat and grime from running! These screen cloths come in cute patterns and are the perfect size for your purse, briefcase or your glove compartment. recommend for runners in the summer? Disclosure: I was provided these products for review, but was in no other way compensated. All opinions expressed are my own.